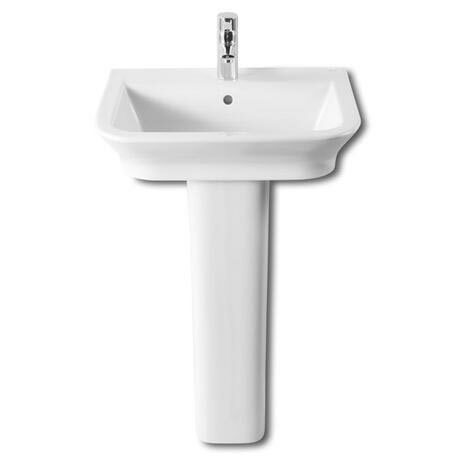 The minimalist designer Roca Gap 550mm square basin with full pedestal, part of Roca's collection of luxurious vitreous china sanitary ware, with its functional and compact design this basin and pedestal provides a modern and stylish solution for optimising any bathroom space. Manufactured by Roca using the best materials and production methods, this means products are more resistant, durable, easy to use and maintain. All Roca ceramics are covered by a 25 Year Guarantee. The perfect balance of beauty and function, the Gap basin with pedestal from Roca offers both in abundance. It is ideal for the contemporary household as it delivers a clean and stylish white gloss finish. It is made from vitreous china which makes it a strong and durable piece of bathroom furniture. Q. Can you supply a shallow vanity unit to go with this sink? Hi, unfortunately we don't sell any vanity units on their own on our website. Please contact info@victorianplumbing.co.uk with a unit you like from a package, and we will look into sourcing it individually for you. Thanks, I hope this is of some help.